First Second Books - Doodles and Dailies: NEWS! YESTERDAY'S NEWS! AND TODAY'S! NEWS! YESTERDAY'S NEWS! AND TODAY'S! GOOD THING FOR GUEST BLOGGERS! I've been away, and just returned, but thanks to our ongoing contributors, traffic here doesn't go down -- the blog is hopping with good stuff! I should stay away more often. 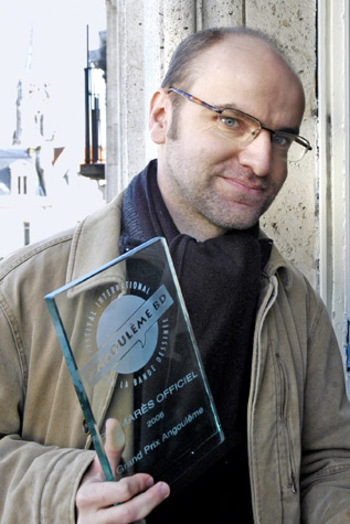 If you haven't heard already, LEWIS TRONDHEIM won the Grand Prize at this year's Angoulême Comics Festival . Congratulations, Lewis! And FIRST SECOND is in the news, in today's Publisher's Weekly, COMICS WEEK, with glimpses of what went into the making of :01.